Be the first to review this 2019 Ford Escape. 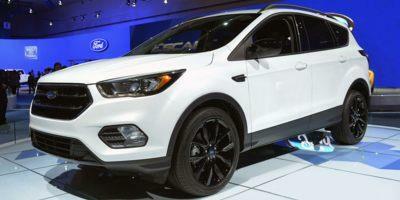 The Ford Escape has been an enormous success, with hundreds of thousands sold each year, for a few good reasons. Chief among them might be its styling. Ford builds many truck-like utility vehicles (soon there will be two more, with the coming return of the Bronco), but the Escape slips into that fleet discreetly disguised as a big hatchback, at least from behind the wheel. A responsive turbo engine complements the snappy handling. This is the seventh year of this generation, and it will be the last, with a redesign scheduled for 2020. For 2019, Ford makes a big touchscreen with Apple CarPlay and Android Auto compatibility standard, on all but the base Escape. The base engine is a 2.5-liter inline-4 making 168 hp and 170 lb-ft of torque. It’s smooth enough, and it’s nearly as fast as the turbo on the freeway, but it’s not as quick. It has a 6-speed automatic transmission that works well, but also works hard with the available power. The upgrade that most buyers choose is the 1.5-liter turbo-4. It makes 179 horsepower and 177 pound-feet of torque, and while that isn’t much more than the base engine, the turbo makes Escape-ing much more fun and adventuresome. It uses the same 6-speed automatic, with welcome paddle shifters. The transmission is able to be more relaxed with this stronger engine. Our own choice, of course, is the hottest engine. That’s a 2.0-liter turbo-4 making 245 horsepower, with available all-wheel drive. From the model’s firm ride to its sharp steering, it creams the competition. The not-SUV styling works on the outside. Inside, the heavily styled dash cuts into some passenger room, and the seats are pretty firm. The Escape is on the small side to start with, having a wheelbase of 106 inches and overall length of 178 inches. It’s not as space-efficient as a Honda CR-V, which has a shorter wheelbase by 3 inches but 1 inch more rear legroom. But the Escape is a good bit bigger than the next smallest Ford crossover, the EcoSport, with a 99-inch wheelbase and length of 161 inches. With the standard 2.5-liter engine and front-wheel drive, the EPA rates the Escape at 21 mpg city, 29 highway, 24 combined. With the 1.5-liter turbo and front-wheel drive, it’s rated at 23/30/26 mpg, or with all-wheel drive, at 22/28/24 mpg. The 2.0-liter turbo-4 gets 20/27/23 mpg with all-wheel drive and 21/28/24 mpg with front-wheel drive. Both turbocharged engines have stop/start technology and direct injection that boost fuel mileage, and all Escapes get active grille shutters that help smooth airflow. Ford doesn’t make forward-collision warnings with automatic emergency braking easy; it’s not available at all on the S model, and is a $1,295 option on the other models, even the top Titanium. Other available safety features include adaptive cruise control, active lane control, blind-spot monitors, and parking sensors.